For other albums titled Anthology, see Anthology (album). 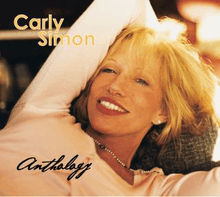 Anthology is singer-songwriter Carly Simon's 26th album, and first anthology album, released in November 2002. It is a two-disc set with all the songs personally picked by Simon. Over the course of the two discs, every one her studio albums (up until that point) is represented with at least one song (not including her just-released Christmas album or her 1993 opera, Romulus Hunt: A Family Opera, on which she only actually performs on one track). The booklet features numerous photographs from Simon's archives, as well as extensive liner notes by Jack Mauro, a lifelong fan of Simon's. ↑ "Carly Simon Official Website - Anthology". Web.archive.org. Archived from the original on February 3, 2007. Retrieved 2014-07-26.